Oh, summer how we love you! While enjoying the warmer weather and catching up with friends, for most of us, summer also means eating, drinking, and sleeping a bit less than we know we should. As we approach the end of summer, now is a great time to start thinking about restoring your body and mind. While we're sleeping, our bodies are fasting which means once we're awake - we need to replenish liquids. One of the best ways is to drink a room temperature cup of water with fresh lemon juice, which will wake your body gently. Be sure to always drink your H2O at room temperature. When water is too cold, our bloody vessels actually shrink and hydration is hindered. Many of us love to drink coffee in the AM (coffee lovers rejoice!). Just try to make a point to drink water afterwards so your body doesn't become dehydrated. Try to drink approximately two litres of water per day. Every person is different and your body really knows what's best, so when you're not thirsty any more - stop drinking. Keep it healthy and eco-friendly by using a non-corrosive metal water bottle that you can refill throughout the day. Repeat after me: Sleep is essential. Sleep is essential. Getting a good night's sleep increases our metabolism, allows our body to heal, our skin cells to replenish, and our minds to process and catalogue the events of the day. Studies have shown that 7 to 8 hours of sleep each night is the optimum amount. While everyone's internal clock is a bit different, a good guide for sleeping a 10PM bed time, and a 6AM wake time. Whatever hours you ultimately end up deciding on, make sure you prioritize time for a good quality sleep. The fact is our bodies are made to move. Lack of physical activity can have negative effects on our bodies and mind. 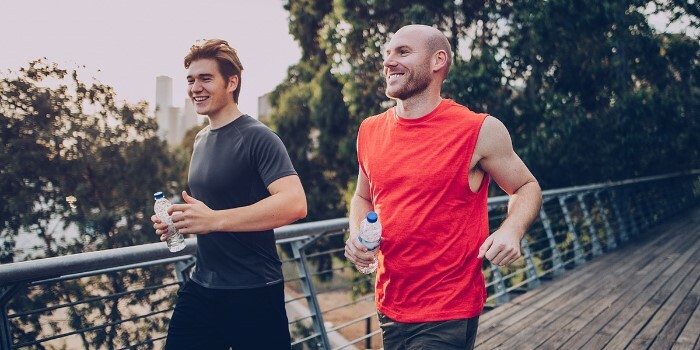 While you should aim to have a regular exercise routine like going to the gym, strength training, or yoga - you can introduce your body to moving by simply making an effort to walk. Instead of jumping off your bus or train stop closest to your work, why not get off a few stops early and walk the rest of the way. Take a taxi or Uber to work? Jump out early, save some cash and get a burst of exercise in, too. While at work, ask for a standing desk instead of sitting on that ancient office chair all day. Taking a walk during your lunch break will also do wonders for your physically, while allowing you to stretch your legs, clear your mind, and get some fresh air in your lungs. There are many scientifically proven benefits to meditation. You don't need to be a zen master to reap the rewards both physically and mentally, either. In fact, one of the best things about meditation is it can be practised wherever and whenever you want. Whether its at the office, on the bus, or at home - start your day with 5 or 10 minutes of meditation. Additionally, taking a brief pause throughout the day to centre yourself will help let go of any stress you may have, whether it be financial or professional. You can start with simple breathing exercises, which will help you regain control of your thoughts and sharpen your focus to ninja-like levels. Everyone knows the best way to start the day is with a nutritional breakfast. Try a delicious smoothie packed with nutritious vegetables, fruits, and protein powder. What about oatmeal for breakfast? Have you tried cold pressed juice? Healthy meals are always in, and breakfast is the best time to explore. Maybe you're not a morning person (that's me!) and never find the time to even grab something in the AM - that's fine. When you wake up, replenish your body with a glass of room temperature water, grab a smoothie or ready-made breakfast bowl at your favourite coffee shop and say goodbye to your hunger when you're at the office. Keeping your metabolism in check by ensuring you eat meals throughout the day will keep your weight balanced, your mind sharp, and your body full of energy. The best time to start restoring your body and mind is now. No delays, no excuses. So, whether you need help purchasing a gym membership, a new mattress to improve your sleep, or a selection of healthy supplements to kick start your healthy eating - a smart Ferratum Money Personal Loan can be just the ticket. Apply today on any device, any time. After you're approved, you'll have the funds you need deposited directly into your bank account by tomorrow. So, how can we help you fund your passion today? Have you ever dreamed about a holiday in Europe? Our travel experts agree these 5 European destinations should be at the top of your list.